The Dubuque Camera Club meeting on April 15, 2019 was attended by 20 people. In addition to club members, we welcomed two guests, Lorna and Mike. Top priority of the evening was judging the Digital Travel category of the N4C competition. There were 93 images from other clubs. Greg Nauman, Kevin McTeague, and Andreas Exner volunteered their time as judges. The judging procedure was facilitated by Ron Tigges, Cara Pusateri, and Ken Kiss. Jennifer Tigges prepared the snacks (Thank you!). Winning images will be posted in the winners’ galleries of the N4C website. Monday, May 6th @ 6:30 p.m. — Club meeting. Send in your N4C submissions. We can submit double travel (DT). This will be your final opportunity to compete until next fall. 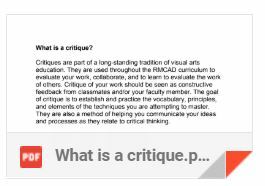 Monday, May 20th @ 6:30 p.m. — Critique night. Club members only, email 1-3 JPGs to Ken Kiss, with Critique night submission as the subject of your email. Images must be received ASAP before the meeting. 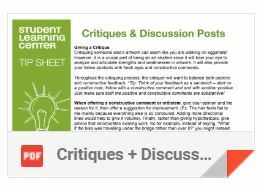 Click here for critique night guidelines. Monday, June 3rd @ 6:00 p.m. — Potluck Picnic. Open to club members and family members/significant others only. Plan to bring a dish to share. Watch your email for potluck details and an RSVP form. IMPORTANT: Reflections submissions are due before the picnic. 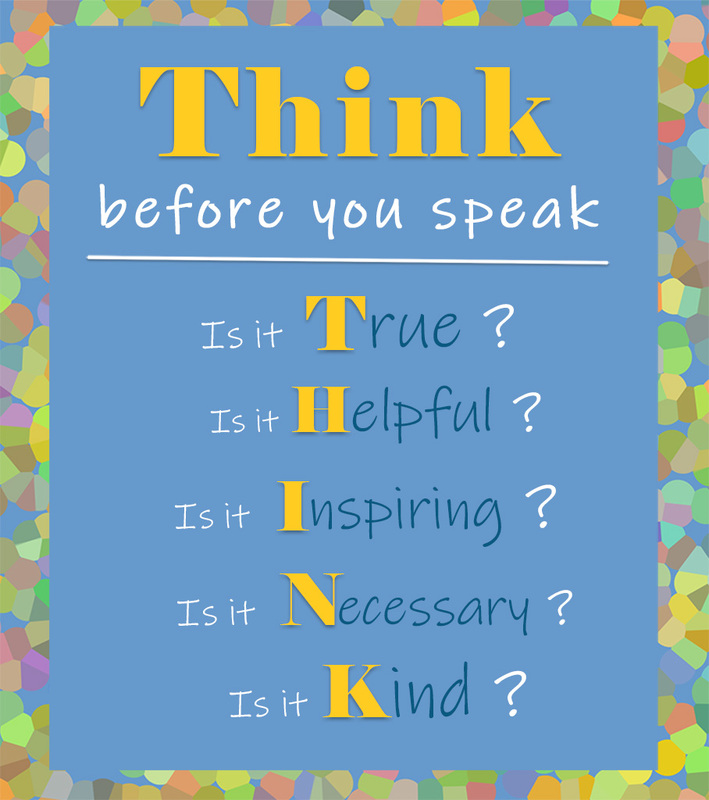 Click here for Reflections guidelines. Find more upcoming photography-related events on the Events Page. The Dubuque Camera Club meeting on April Fool’s Day was attended by 17 people. No jokes were played. Instead, we enjoyed some compelling discussion, planned a few upcoming club activities, and looked at a bunch of interesting photos. Much discussion happened regarding how to obtain prints for the club’s Reflections exhibit this fall, our 7th annual exhibit at the Dubuque Museum of Art. Click here to read about Reflections guidelines. 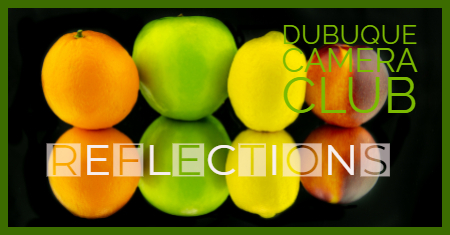 Click here to read the guidelines for the club’s Reflections exhibit. Art opportunity. Ron showed some photos of the Radio Building that was recently purchased by art museum supporters, and talked about the Flash Happening art event that will be held inside the building during this year’s Dubuquefest (May 17-19, 2019). Artists are currently being lined up to create temporary installations. Afterwards, the building will be demolished. Contact Ron for more details. Panorama competition. If you want to enter the N4C panorama print competition, you can bring your print to the next club meeting on Monday, April 15. They should be mounted on foam board (?). There are no size or subject limits. Aspect ratio must be greater than 2:1. Ron will make sure the prints reach the Wesley Woods min-con on May 3-5. (See the March 18 meeting notes for more info about this competition). Brainstorming club activities. The club held a short brainstorming session to discuss next season’s activities. We definitely want to host more speakers/presentations. Those we had this year were interesting and worthwhile. A few names of potential future speakers were brought up. Club members were also enthusiastic about hosting photo shoots during the summer. We could have a night shoot (Milky Way, etc.). Potential locations were brought up. It could be a learning session for people who are not familiar with this type of photography. Probably, someone in the club would need to step up as organizer. Stay tuned for more details. Photo Critique Night on May 20. The club decided that the second meeting in May will be a photo critique night. Members can submit 1-3 images and receive constructive feedback from others. It’s OK for these photos to be potential Reflections submissions. Photoshopped images are OK too, or anything else you might want feedback on. General Bob offered to share helpful information about giving critiques. He is taking photography classes and has photo critique guidelines to share. Ken volunteered to put the photos in the club’s Smugmug gallery. Email images to him before the meeting, and make it clear that they are for Critique Night. More details will be discussed at the next couple of meetings, and a reminder will be emailed to members. During the 2019-2020 N4C season, our club will judge the monthly competition three times. Judging will happen during our second meeting of the month (i.e. on the 3rd Monday). Submissions are due by or before the first meeting of the month (i.e. the 1st Monday). Because May is the final competition of the N4C season, when we judge in May, double submissions are accepted the previous month, in April. (The N4C season runs from Sept. to May, so there are no entries in June.) Confused? Me too. You may want to look at the N4C rules. September 16, 2019 Nature (DN) No DN in Sept. Double in Oct.
February 17, 2020 Pictorial (DP) No DP in Feb. 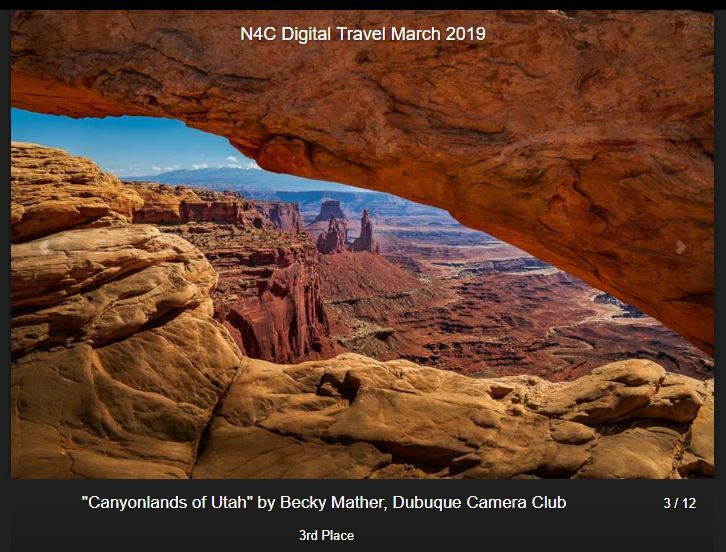 Double in Jan.
Our club will judge Digital Travel at the meeting on Monday, April 15th @ 6:30 p.m.
About 45 people attended the Dubuque Camera Club meeting on March 18, 2019. What a nice crowd! 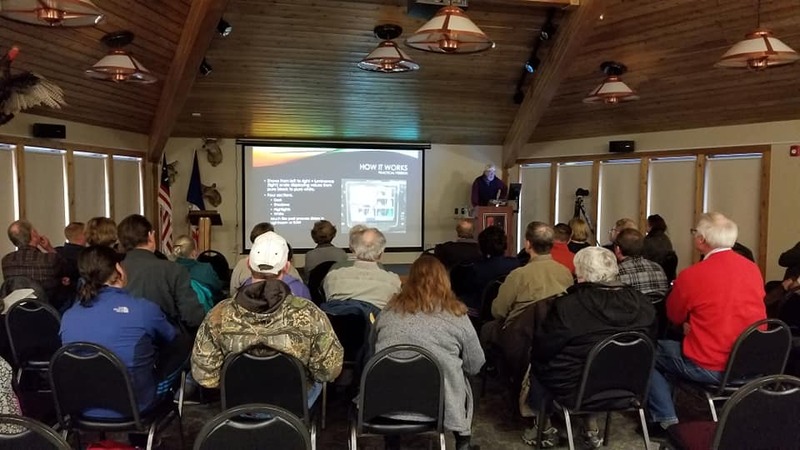 Dubuque Camera Club meeting on March 18, 2019. Histogram Magic presentation by Henry Mattheissen III. Photo by Amy Laskye. We learned helpful tips about stretching out the tonality of an image, and heard about the perils of photo expeditions to the desert! More than one person in the audience was spied taking notes (F/9, 1/125, ISO 100). The storm chasers present were intrigued by Henry’s panoramic images of cloud formations. Not only does he bring out the dramatic range of an image by using his camera’s built-in histogram, he also emphasizes the sky by using a two-stop graduated neutral density filter. These techniques result in some nice pictures! Thanks to Henry for sharing his photography expertise during tonight’s meeting! Panoramic Print Competition. The N4C will be judging panoramic prints during the upcoming spring mini-con in Indianola on May 3-5. If you would like to enter (one entry is allowed per person), contact Ron or Jennifer. They will be taking print entries to the event (prints must be of a size to fit in their vehicle). 1. A Panorama print is considered to be a photographic print with an aspect ratio greater than 2:1 with no square inch limitation. 2. Open contest, any subject, mode or process, color or Black & White, one entry per member. Photo essays and Video essays will also be shown during the mini-con. Our club has never(?) entered either one of these annual competitions before, so if you want to be an innovator, please step up. These two categories are submitted digitally. Complete rules are in the February N4C bulletin. Deadline is March 31. If you would like to go to the mini-con, you must mail your registration by April 17. Complete info is on the N4C website. Be sure to read the Feb. and March N4C bulletins on their website because they also contain pertinent info. If you read 365ink magazine, you may have noticed they have begun to use a social media hashtag to gather image submissions for their regular photo page. If you have taken local event photos that you want to bring to their attention, when you post them to Facebook or Instagram, use the hashtag ‎#my365ink‬. On the other hand, if you get a hankering to submit a photo to appear in the Telegraph-Herald (they run a lot of backyard bird photos), here is the link to Pix & Flix. Club member Jesse Green has invested in a mirrorless camera and is starting to take pictures. The camera’s monitor is a pleasure to look at! In addition to showing off his new toy at the meeting, Jesse has posted several images to the club’s Facebook group. Club member José Garcia is making an awesome leap in his photography career! Some of his photos will appear in an upcoming issue of Photography Masterclass magazine. 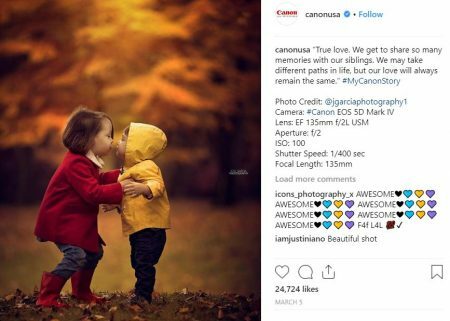 On Instagram, he has been noticed five times (so far) by the official Canon USA Instagram account. This has led to an opportunity to be part of the new Canon USA Ambassador program. He will travel to other midwestern cities to lead workshops on portraits, astro-photography, landscapes, and off-camera flash portraits. Congratulations, José! Online photo sharing (via Flickr) also led to an opportunity for club member Pamela Brandt. She was asked to contribute images to a commemorative book of photos and essays that will celebrate the first hundred years of Iowa State Parks, 1920-2020. The book will be available at the end of the year, with proceeds going to state parks projects. 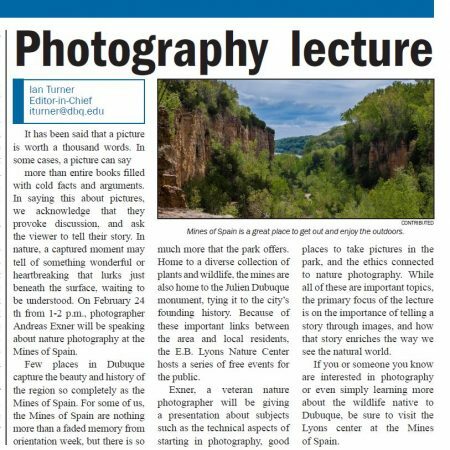 We recently learned that Andreas Exner, who gave a presentation on Storytelling in Wildlife Photography a few weeks ago, was mentioned in the Feb. 2019 issue of the Belltower, the student newspaper at the University of Dubuque. The complete issue is here. A photo from club member Debbie Denlinger appeared under “Write the Caption” in the Dubuque Telegraph-Herald on Sunday, March 31 (p. 21A). What a cute image, Debbie! 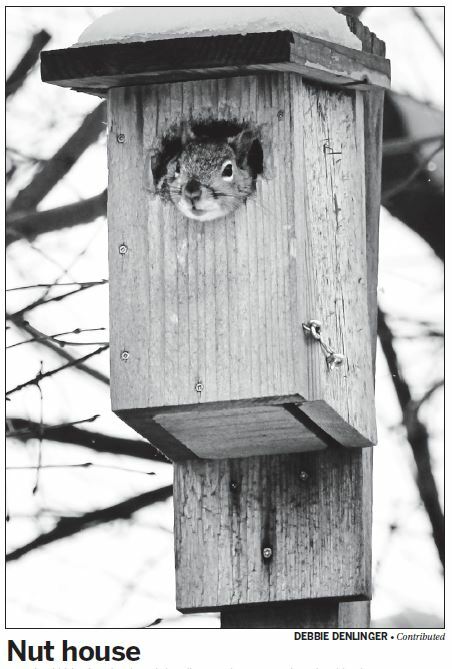 The April-May 2019 issue of Our Iowa magazine contains a photo by club member Robert Felderman. It is also up for an award. You can vote by sending an email to hotline@OurIowaMagazine.com and letting them know that PHOTO NUMBER FOUR is your top choice! 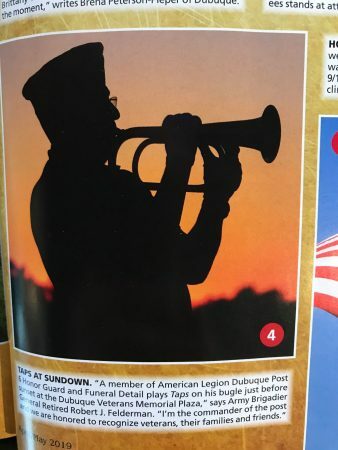 “Taps at Sundown,” by Robert Felderman, in the April-May 2019 issue of Our Iowa magazine. Do you have photography-related news or events to share here? Please let Pamela know! After all, “None of us is more than all of us”! April 1, 6:30 p.m. — Club meeting. N4C submissions are due before the meeting. No Travel submissions this month. April 15, 6:30 p.m. — Club meeting. 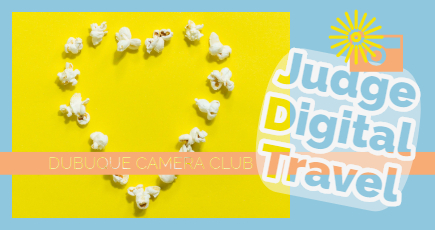 Our club will judge Digital Travel (DT). We will have refreshments! Please attend! May 3-5 — N4C mini-con at Wesley Woods, Indianola, IA. More info here. Contact Ron or Jennifer if you want to submit panoramic prints. May 6 — Club meeting. N4C submissions due. We can submit double DT. May 20 — Club meeting. Presentation or workshop, TBD. June 3rd, 6:00 p.m. — Annual picnic. Open to club members only. Last meeting of the regular N4C season. “Reflection” submissions are due. FIND MORE INFORMATION about upcoming photography-related events on the EVENTS PAGE.